Fast single tool changing - no need to touch drawbar after inserting master holder. Spring collets are hardened and ground for maximum holding power and ultra precision. MT3 shanks ultilize a drawbar thread: 1/2 - 13TPI. Collets must be snapped into nut before inserting and tightening into holder. 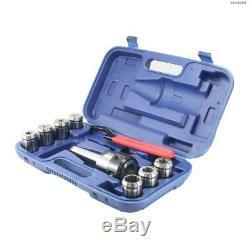 8 pcs MT3 set includes: collet chuck, 7 full grip collets 1/4", 5/16", 3/8", 1/2", 5/8", 3/4", 1 andner wrench. Drawbar Thread 1/2 - 13TPI. Spring collets are hardened and ground for maximun holding power and ultra precision. The item "Bodee MT3 Quick Change Collet Chuck Set Full Grip 8PCS" is in sale since Thursday, December 14, 2017. This item is in the category "Business & Industrial\CNC, Metalworking & Manufacturing\Workholding & Toolholding\Workholding\Collets".